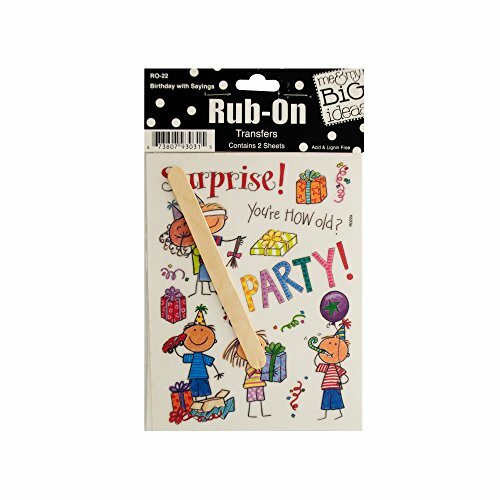 Perfect for scrapbooking, card making or any craft, these fun Birthday with Sayings Rub-On Transfers feature various birthday-related phrases, words and designs. Includes two sheets of transfers and an applicator stick. Transfers can be used on paper, wood, fabric and other surfaces. Acid and lignin free. Comes packaged in a poly bag with a header card. Package measures approximately 8" x 4.5". If you have any questions about this product by 123-Wholesale, contact us by completing and submitting the form below. If you are looking for a specif part number, please include it with your message.